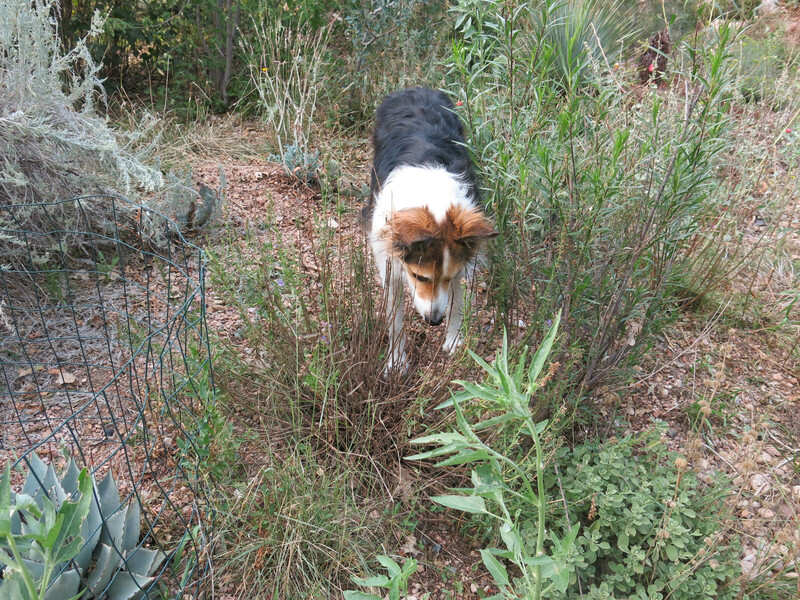 Greetings and salutations, everyone; yes, once again it is I, your popular host, Mani the purebred border collie, here to bring you the latest news from our garden on this very smoky day. You may remember me from such smoke-related posts as “Shedding Light”, among at least a few others. Here I am in a characteristic pose. I like lying by the back door. I often just fall asleep here. It turns out to be a nice place to lie. You can see the non-slippery rugs the guy I live with bought for Chess. He decided to keep them in the kitchen, just in case. You can also see that my hindquarters have a lot of mats. They’re being worked on, slowly. Trimmed and stuff. I hate being brushed. 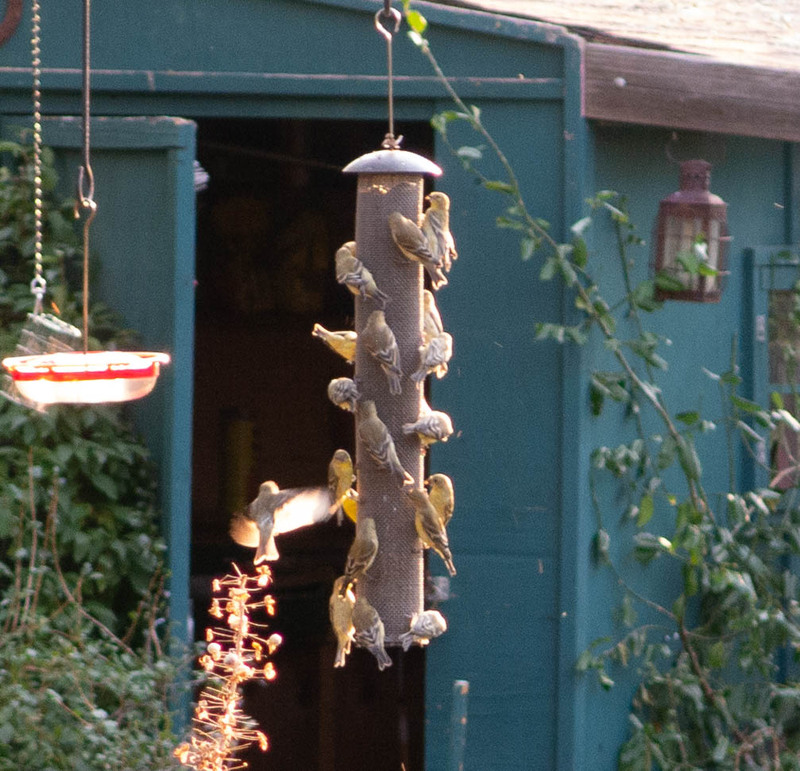 If you didn’t see the picture of all the goldfinches at the feeder, posted on Facebook, here it is. 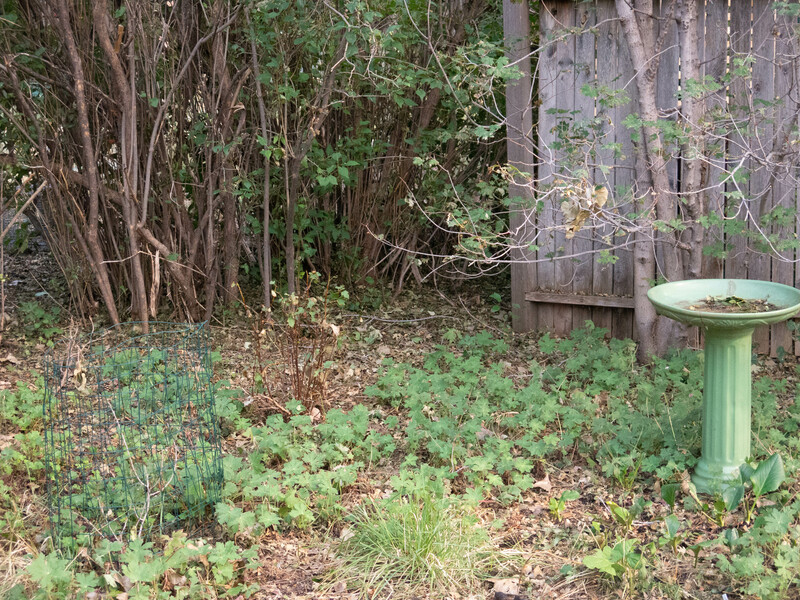 He went out and bought another feeder and so now the goldfinches have disappeared. Maybe they don’t like all the smoke in the air. I guess we’ve mostly recovered from the hailstorm last Tuesday. The guy I live with said the roof looks okay, but he really doesn’t know what to do. Most of his neighbors aren’t getting new roofs. He said he’s had a very hard time making decisions, since his wife died, and sometimes does nothing. It was good that he knew it was right to get me, though, of course. The other day he said he was going to save up for a bunch of repairs to the house, or maybe take out a loan, and then we were going to move. I rolled my eyes when I heard that. Though living in a place where there aren’t so many storms might be nice. “Maybe with sun more than once every ten days in summer, too”, he said. I like it cooler. I wondered if he might not benefit from some Rescue Remedy and maybe even a Thundershirt. This has been a very anxious summer for him. He’s a worrywart. (His wife was the opposite; she thought his worrying was stupid, which of course made him a little cross, but he misses hearing that calm voice.) 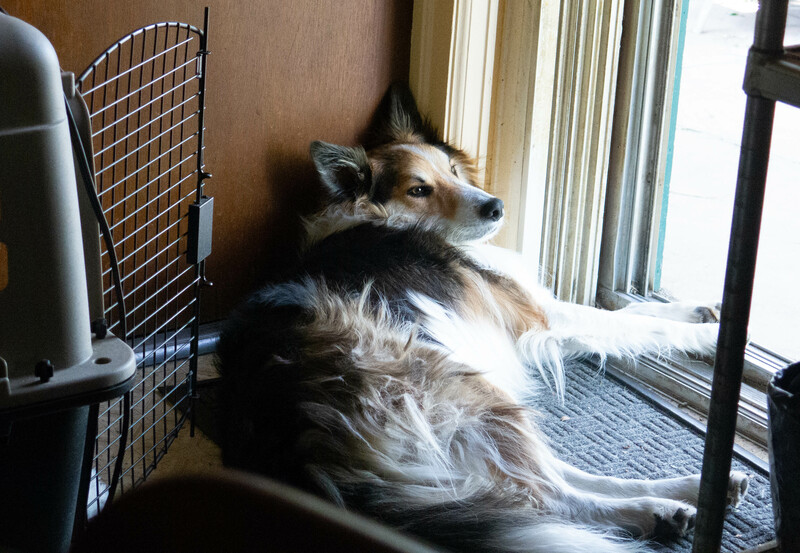 We purebred border collies tend to worry about things, too, and I don’t like thunder and lightning at all, so I’m not really being critical. He spends a lot of time looking at the radar (he’s kind of a nut, if you didn’t know), watching Endeavour over and over again, and also Q.I. I can tell when he’s watching Q.I. because he laughs so much. It must be a funny show. Last Saturday they predicted bad storms again but instead it just poured rain. We got about half an inch of rain, which might help the garden recover. The storm drain across the street was completely blocked by leaves. 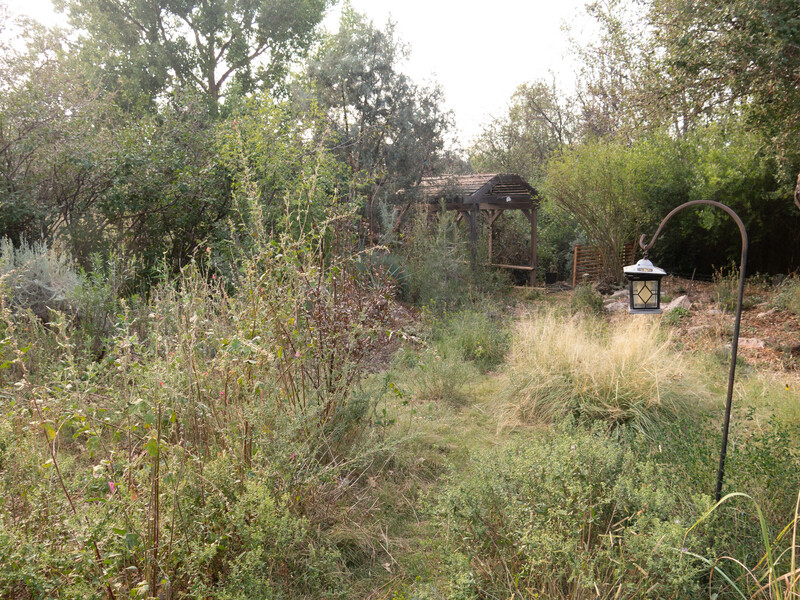 Anyway the garden doesn’t look so terrible unless you get really close to the plants. Some of the trees are in pretty bad shape. But he said the storm of 1991 stripped bark from the trees. 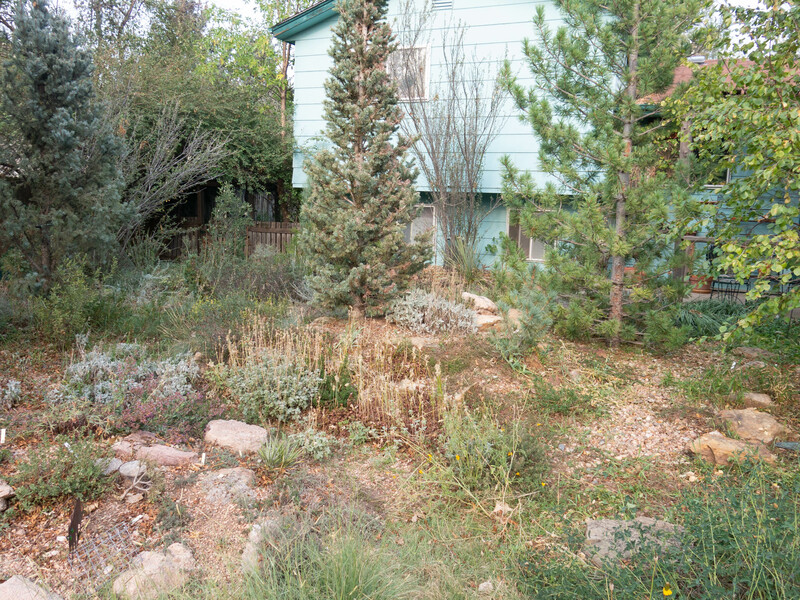 The cercocarpus next to the house has almost no leaves. Probably too late for them to grow back and it might affect the plant’s ability to make sugars to prepare for cold in the winter. I guess we’ll see. Me, on patrol. The mountain ninebark, Physocarpus monogynus, has almost no leaves, too. We didn’t do much in the garden today because of all the smoke. 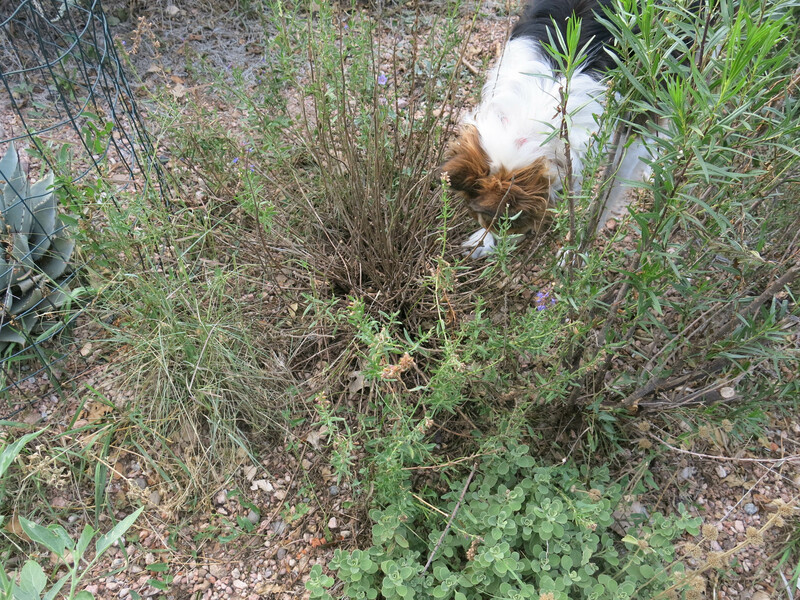 Oh, well, he did decide to toss the tomato plants. They were so pathetic it was painful to look at them. There were some tomatoes but they’d been battered by hail. So the plants were thrown into the garden. He said showing pictures of them would just be sad. I guess if we grew a lot of vegetables they would be grown under a structure like the bulb frames, covered with hardware cloth. It was an okay day, I guess, even though not much got done. I decided to enliven it a little by going on a snake hunt. “An illegal snake hunt”, the guy I live with said. Hunting snakes is a bad thing. But I like to do it anyway. He said I missed the really big one out in the corner of the yard. I did dispatch a large one a while back, and he was extremely angry with me. I got a lecture. This one wasn’t very big at all. It was a Plains Garter Snake, Thamnophis radix. They’re completely harmless, except if you’re a mouse. Here I am, hot on the trail of the snake. 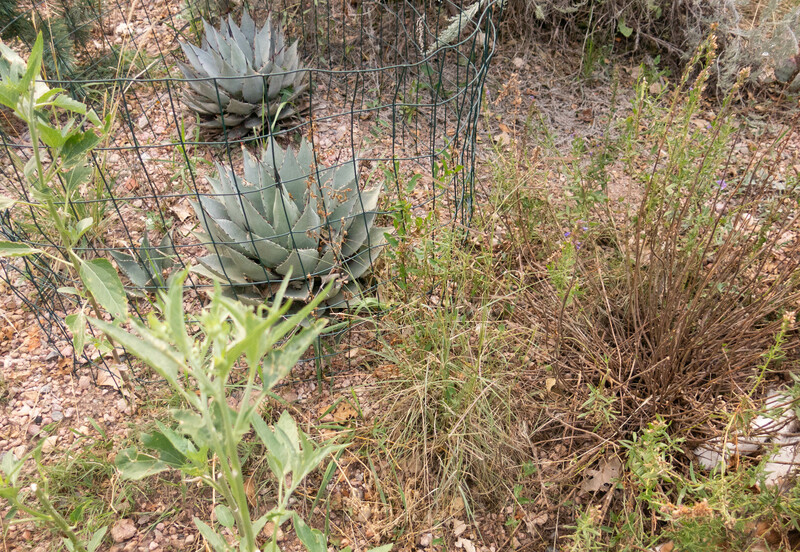 Maybe you can see the agaves in the fence behind the desert willow I’m looking under. 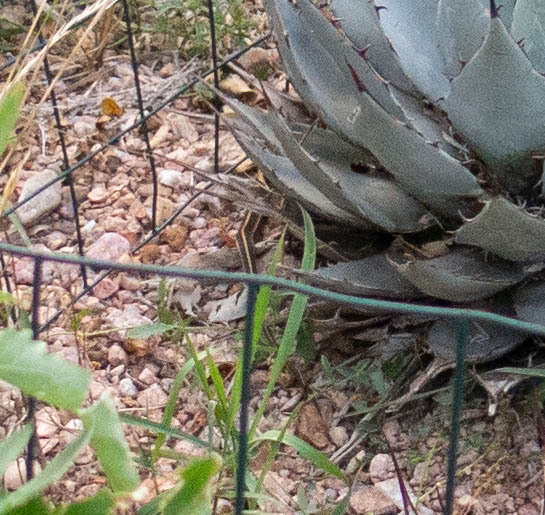 The agaves are fenced to protect me from getting jabbed. I’m not supposed to be in the garden. Still looking. Meanwhile, the guy I live with was looking for it too. He said it was under the agaves, and heading west. That’s me in the lower right, looking. You can see its striped tail in this picture. I was still looking over here. 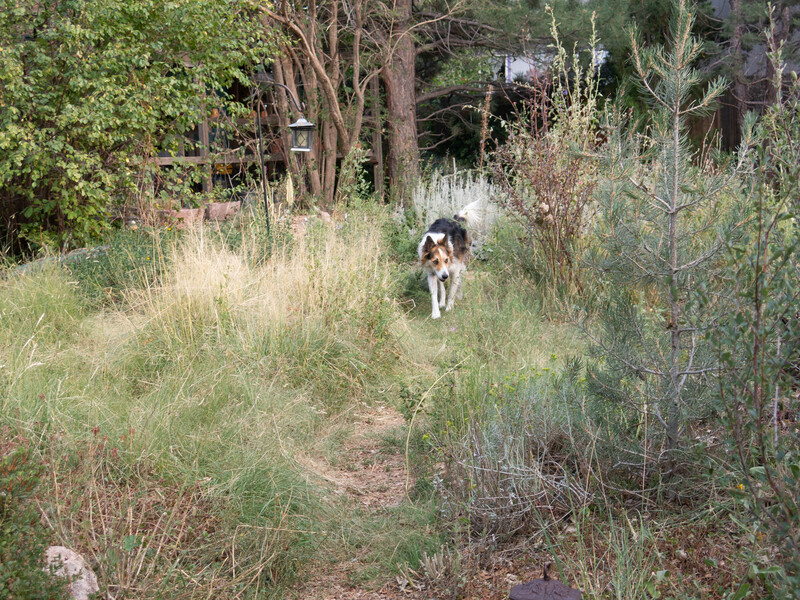 Eventually the guy I live with undid the hose so he could water the side yard, and I got more interested in that. Hoses and snakes are kind of alike. So that was our day. They say it’s supposed to be less smoky tomorrow. It might even rain. Mani, It is still smoky here, but not as bad. No rain in sight. We really could use a good down pour. Watch out for snakes. Some are not to friendly. I worry a lot about things too. I did get Jack one of those thunder shirts and it worked like a charm. The guy I live with said that he would prefer a sort of balance between a whole bunch of smoke and garden-destroying hailstorms, but he hardly ever gets his way. Gentle rain, like where it just rains for hours, would be nice, but we rarely get that. The downpours don’t get the garden as wet. We have had terrible smoke. Some days it’s all I can do to get the vegetables watered. I think the blueberries were damaged last year, most had no berries this year. 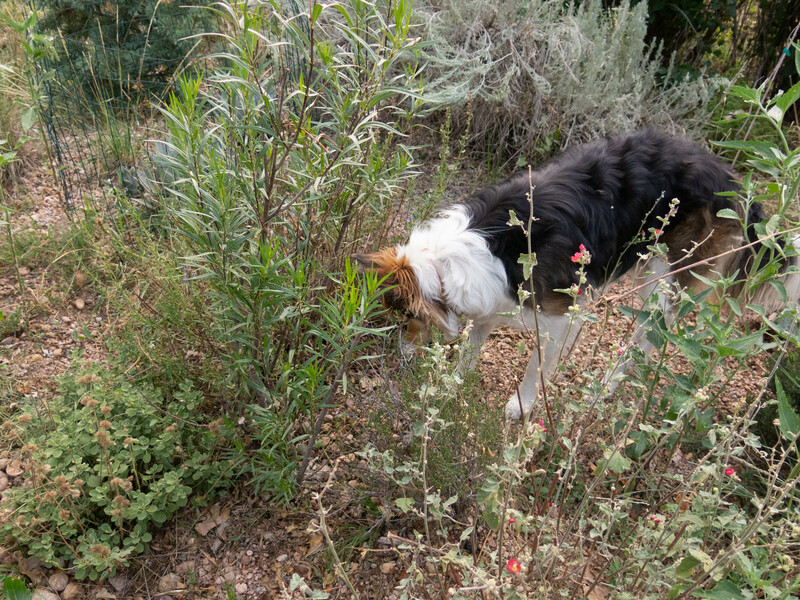 You and my not-purebred Border collie, Boo, are so similar! Boo hates brushing. Just a few days ago I had to cut off his lovely flowing hindquarter hair! It looks terrible, but if he won’t let me brush him all year, that’s what he gets every summer! I love the comb that has sharp blades in it so as you comb it cuts the mats, but he throws a fit and acts like I cut off his… well… he checks his… um… you know. He always checks that when he’s recovering from a fright! Boo’s “brother” has allergies, so the smoke really gets to him. He hasn’t even been allowed on car rides to the gas station, coffee stand, or to pick up his meds, places where he gets biscuits. Boo does’t go out, he has agoraphobia. Last time he went out for shots he got a virus. Your lucky to go to doggy day care and have a social life! You probably knew where the snake was all along, just too wise to confront it. Plus, it was probably fun to fake out the man you live with! Thanks. I am very lucky to have playmates. I really look forward to it. Since it’s at the doctor’s office I get shots there too, once a year, and hardly even notice it. I think there was one time there when I got brushed, but mostly that’s done here at home, since the guy I live with says he’s very good at that. He said if I didn’t sit sit I’d be sent off to something called a “groomer”, which sounds scary. There’s no smoke here today because it’s cloudy and dark and we’re going to have storms again. ” I love the comb that has sharp blades in it so as you comb it cuts the mats, but he throws a fit”. Have you tried a single edge mat splitter? Our dogs tolerated it much better than the mat rake style which they hated. The Furminator model for long haired dogs has worked well for preventing any matting. Thanks for the suggestion. He’s just a wiener, hates any touching other than pets and pats, tummy rubs and scratches! No combing, brushing, nail trimming, ear cleaning…just a big baby wiener! The guy I live with got the names of two groomers from the vet’s office, and said if I didn’t sit still I might have to go there. The guy I live with has tried using such a thing on me. I can outrun him. Hi Mani, Please leave the snakes alone. I know their movement tantalizes you into chasing them but try to stop yourself. Your friend is right about not stalking and hunting snakes. Stick with the hose! Endeavour is an excellent series. I loved Morse and enjoy the notion that with Endeavour I learn what life experiences shaped his adult self. Try not to worry about the trees. They often can survive without leaves this late in the season. Hopefully, they’ll focus on their roots.In any case, it’s out of your control as is much of what happens in our gardens! And I think that’s how it should be. Enjoy the goldfinches when they return. Who can blame them for avoiding lots of smoke? The goldfinches came back a little while ago but then were scared by two big hawks, one of which was in my yard. Pretty scary indeed. The guy I live with said the hawks like to hunts snakes too, but for a different reason. The guy I live with has been watching Endeavour over and over again. He got the fifth season and likes it a lot. He said it was interesting to read in the Archibald seed catalog, years ago, how the Archibalds were collecting seed in Iran and Inspector Morse was very popular there, dubbed into Farsi. Inspector Lewis is pretty good too. Iranians are sophisticated people. No surprise that they enjoyed Morse. They’re probably watching Endeavour right now!! There are two Italian detective series that your friend might also enjoy: one called Montalbano (set in Sicily) and another called Fog and Crimes (set in Trieste). You might enjoy hearing the beautiful, melodic Italian language as well as the occasional dog adding his or her two cents to the dialogue! The guy I live with really likes Mrs. and Mrs. Murder; an Australian show which is pretty funny, but only ran for one season. And Miss Fisher, too. I have a hurt leg and just came back from the doctor’s. I guess it’s not too bad; maybe just a sprain, but I don’t get to do much of anything for a while, which’ll be no fun. Mani, Mani, Mani, border-collie up. Accept the groom session. I groom Shredder the Maltese – thick curly coat – and Petey the terrier – nice silky hair but gnarled up by rolling around and playing at dog park – each evening. Shredder is stoic, which you should be. Petey is lost in ecstasy, like I am when I get a massage. Of course, if the guy you live with does the groom on a *regular basis* the job goes easier. Do you know, you look absolutely adorable when you suss out snakes, but Don’t Do It, even stripey-tail ones. I sense an amount of push/pull between you and the guy you live with, I really do. 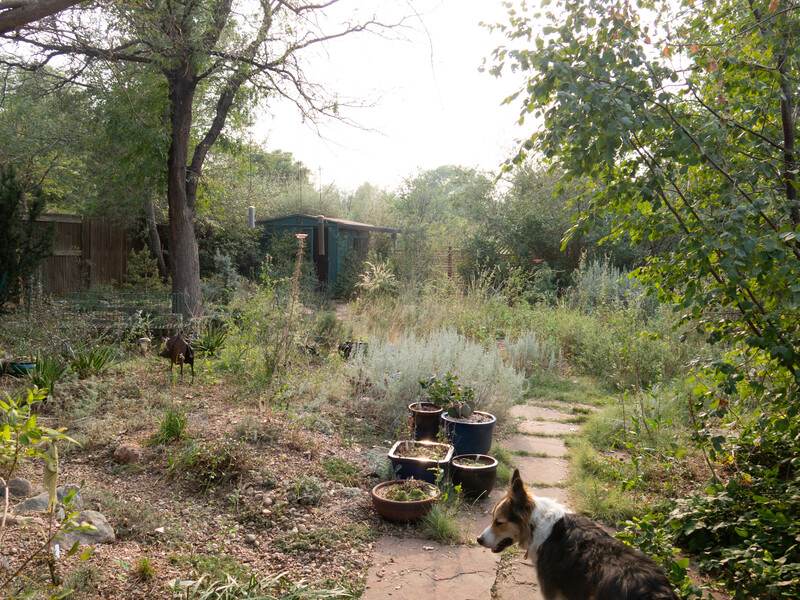 Your garden continues to look well, even with dead trees. We’ve got one too, we just noticed, so out it comes. No problem making that decision. Honestly, I went back up and reread the post, and I feel you should be given lots of credit for so nicely living with the guy. You might inform him lectures don’t do anything. Good luck with the smoke and the hose. Thanks, I can be adorable, can’t I? The guy I live with is constantly trying to brush me. Like sneaking up on me and stuff. There wasn’t any smoke today, I think. We had a little thunderstorm and a tiny bit of rain. That is a big herd of finches! Those are the little bastards that came into my dining room to eat the sunflowers that I cut and brought it! They made if abundantly clear that I would not cut any more sunflowers ever again. Squirrels eat them here. People think “sunflowers”, but forget to think “squirrels”. Like there was one time, years ago, when the guy I live with thought “pear tree”. Someone who had a pear tree said “raccoons”. I have a pear tree, and I say “rats.” Also tomatoes. I find a flea comb works well on mats, but you won’t enjoy it, Mani. Sorry. I guess I don’t have to worry about being brushed for a while. I hurt my leg (muscle) so the doctor says I have to take it easy for a couple of days, and it would be downright mean of the guy I live with to try to sneak up on me and brush me, what with my leg and all. My leg is much better than it was yesterday. And that’s why we leash our beast prior to reaching for the box of grooming tools. I suppose I could let him try that. Lol. Ask TGYLW if he has subtitles for QI? I find that when they are all laughing and talking at once it’s like they are speaking a foreign language. The free program I use doesn’t provide subtitles. Yes, the guy I live with watches Q.I. on his Amazon FireStick and has a BritBox subscription, and there are subtitles. Many of the people on Q.I. are amazingly quick-witted and funny. He has Acorn, too. Pretty much all he watches these days. Hi Mani, I’m sorry to hear that you hurt your leg. Please take care and let the guy you live with pamper you big time!! Thanks. My leg is much better now. The guy I live with said he would sing “Soft Kitty” to me later. Even though it’s about cats. Thanks. The guy I live with did say “injured and drugged is a kind of sick”. I didn’t get it at first. I can barely imagine what goes on with toothbrushing. We haven’t tried it yet. Chicken flavor toothpaste. Yeah. The guy I live with used to have gloves sort of like that. That fancy flavored stuff is quite pricey. We use plain ol’ baking soda several times a week. Healthy teeth, healthy dog. Gums bleeding be bad. Well my doctor said I might have to have my teeth worked on there. My teeth are in really good shape but there’s some tartar. I feel a need for “like” or heart buttons some of my other blog posts sport so I can let commentators know how much I like their wit and intelligence. But I already know, Mani, the guy you live with will get around to it about the time you experience your first tooth-brushing (which Petey and Shredder Dog get every night, just saying). The guy I live with said just because there’s a packet with toothpaste in it on the kitchen table doesn’t mean brushing will necessarily take place. Right now I’m very unhappy because I have to have “quiet time” so my leg gets better. I did get to go for a walk a little while ago. The guy I live with is unhappy about this, too. Hopefully doggie anasthesia is not involved. It’s why we persevere now. Max the hero dog taught this. Yes, anesthesia was suggested. Which is why there’s chicken-flavored toothpaste on the kitchen table.